Reciprocal interactions of cells with their microenvironment are fundamental to multiple cellular processes necessary for tissue development, homeostasis, and regeneration. It is becoming increasingly apparent that while the extracellular environment normally maintains tissue homeostasis, but when negatively perturbed, it may also contribute to disease progression and age-dependent pathologies. However, it is still unknown how the extracellular matrix contributes to tissue regeneration and how changes in the extracellular matrix induces differential cellular responses in diseases. In this talk, I will discuss our efforts to delineate the role of the extracellular matrix on cellular responses relevant to tissue repair, stem cell differentiation, and disease progression. First, I will talk about a biomineralized matrix that we have developed through a biomimetic approach. This matrix emulating the calcium phosphate (CaP)-rich bone microenvironment can be used to treat critical bone defects, as it recruits endogenous cells to form vascularized bone tissues. This biomimetic matrix also allowed us to examine the molecular mechanism by which CaP minerals induce osteogenesis of stem cells, while inhibiting their adipogenesis. Our studies show that extracellular phosphate uptake through SLC20a1 supports osteogenesis via adenosine, an ATP metabolite, which acts as an autocrine/paracrine signaling molecule through A2b adenosine receptor. I will next talk about our recent efforts on understanding the role of extracellular matrix on cancer metastasis and fibrosis. Fibrosis is a pervasive disease in which the excessive deposition of extracellular matrix (ECM) compromises tissue function. Although the underlying mechanisms are mostly unknown, altered matrix properties have been proposed as a contributor to fibrosis rather than merely a manifestation of the disease. Here, I will discuss the contribution of elastic fibers, an ECM component, on fibrosis. We show that loss of fibulin-5, a matricellular protein that contributes to elastic fiber assembly, not only decreases tissue stiffness, but also diminishes the inflammatory response and abrogates the fibrotic phenotype in a mouse model of cutaneous fibrosis. Increasing the matrix stiffness raises the inflammatory response above a threshold level, independent of TGF-β, to stimulate further ECM secretion from fibroblasts and advance the progression of fibrosis. I will end by briefly introducing our efforts to develop vascularized tissue and healthy and disease tissue models in vitro as a technological platform to study basic concepts and screen drug and small molecules. 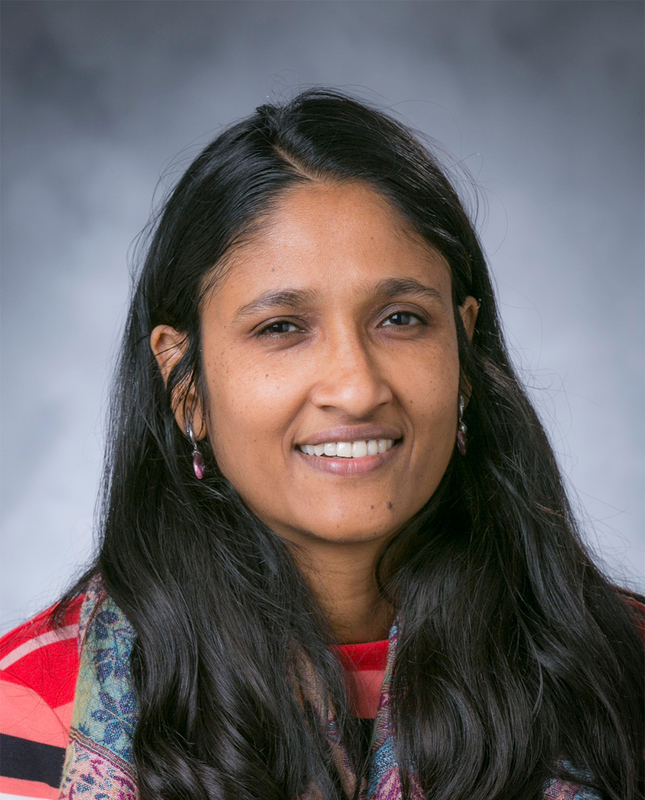 Shyni Varghese, Ph.D., is a Professor of Biomedical Engineering, Mechanical Engineering & Materials Science, and Orthopaedics Surgery at Duke University. She is also the inaugural MEDx investigator at Duke University. Prior to moving to Duke, she was a Professor of Bioengineering at University of California, San Diego with affiliations in NanoEngineering, Materials Science and Institute of Engineering in Medicine. Dr. Varghese’s research is at the interface of biologically inspired materials and stem cells. Dr. Varghese has co-authored over 90 peer-reviewed research articles, covering a wide range of interdisciplinary topics in stem cells, smart biomaterials, biologically inspired systems, and regenerative medicine. Her research activities have also resulted in over 12 patent disclosures. Examples of ongoing research activities in her laboratory involve developing functional biomaterials such as self-healing materials; technologies to improve stem cell based therapies including stem cell differentiation, cell transplantation, activating endogenous stem cells, engineered functional tissue grafts; and organ-on-achip systems. She serves on various scientific bodies and is also on the editorial board of a number of journals and a consultant to various biotech companies. She is currently serving as an associate editor of Biomaterials Science (an RSC journal).